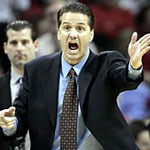 The Memphis Tigers style “Dribble Motion” Offense was described by Head Basketball Coach John Calipari as the “Princeton Offense” on steroids. While the comparison is a stretch, this basketball offense is highly effective with a perimeter-oriented team because it depends more upon the basketball skills of the individual players than a typical man offense. There are very few basketball screens in this offense and the post touches are from reversals or from drive/dump situations. Derrick Rose, a future NBA lottery pick, led his team to the national championship playing the point guard position. 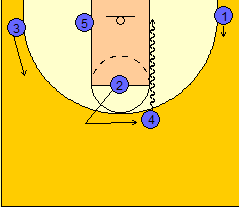 ATTACK - Point Guard initiates the action with a dribble move in the breakdown zone and the other offensive players make necessary reads off him. 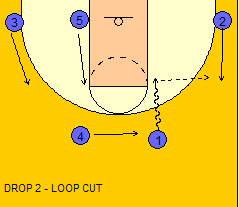 LOOP CUT - When an offensive player with the ball gets in the drop zone (#1), the offensive player in the corner makes a straight cut/read out of the corner and the ball is passed to this man (#2). 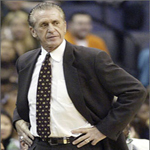 The offensive player that passed the ball makes a "loop cut" and replaces the offensive player he passed the ball to. Player #2 attacks the middle of the floor with a dribble move. 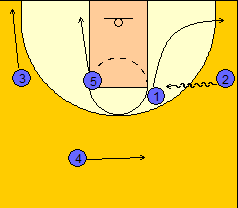 Player #2 has the option to attack baseline side for the drive/kick to #1 or dump pass to #5 OR pass to #3 in the corner for the three point shot. Also can pass to #4 then replace high. 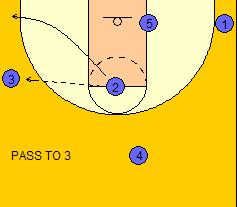 On middle drive, #3 fills the FT line extended for the shot/drive. Player #2 would replace #3 in the corner on the pass. KEY COACHING POINTS: Landing on two feet on the catch and rip/explode to the middle is option number one. On pass to #3, #2 fills the corner spot. Drive/Kick options continue with reads from where the ball handler gets to with the basketball. 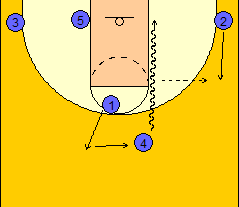 The key here is to land on two feet and set a type of brush screen into the defense to create a lane for the drive. 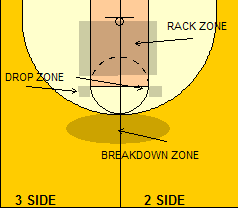 From here if the #4 man cannot get to the RACK ZONE then the ball is passed to the 1 in the corner and the Dribble Motion continues. 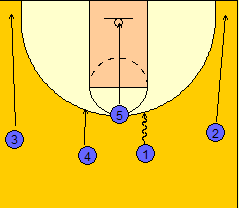 Player #4 has the option for #5, #1, or #3 when the ball is driven hard at the rim. 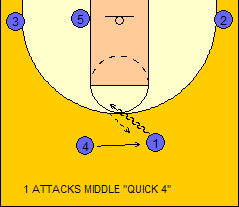 QUICK 4 -This is an option when the #1 attacks the middle from the basic set. Player #1 jump stops in the pass of #4's defender while #4 replaces #1. Player #4 fills behind and #1 pitches to #4. 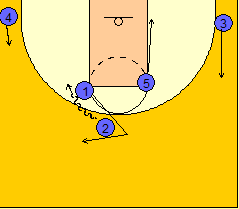 Player #4 tries to get to the RACK ZONE for the lay-up or pass/lob to #5 for the finish. 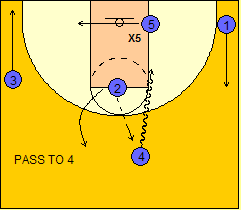 Player #4 can also pass the ball to the #2 coming out of the corner. Player #2 looks for shot and then drives ball to the middle of the court. 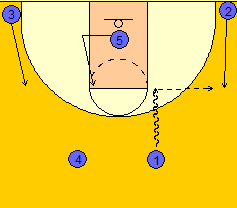 Same options as before, continue to dribble penetrate. 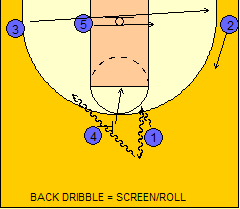 BACK DRIBBLE - Player #1 back dribbles then #4 rotates to set a ball screen - many times Memphis will slip this screen or the #1 will simply refuse the screen and attack the lane line again. 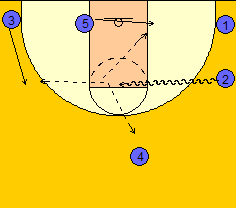 If the #1 refuses to use the ball screen, we are in the same motion options as before. 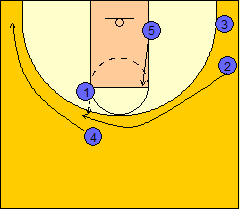 However, if #1 uses the screen, #4 man slips it and then replaces the 1 spot. 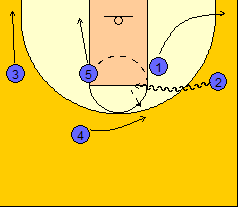 Player #3 comes out of the corner two steps. The Memphis Motion Offense is reset from this point.